If you are looking for a quick setup e-mail service, here is our guide to our Basic and Enhanced email hosting services. Hi and welcome to PolarisMail! To setup your new email accounts you will have to follow these steps for a quick setup guide, like setting up your domain (if you want to use your own), adding new email accounts, logging in to supported Webmails and synchronizing email on your devices. If you are looking for an advanced setup for your email account you can check out our Advanced Setup Guide. When you signed up you had to choose a domain option: either use our domain, polarismail.NET or use your own domain. If you chose @polarismail.net option you can skip this step. To use your own domain you will have to first add one in the Control Panel. Use your Admin username to login to Admin Control Panel, Domains tab and click the “New Domain” button. Fill in your custom domain name and choose a default Webmail (you can update this option later). Don’t forget to change yourdomain.com with your own domain name. To add a new e-mail account login to Admin Control Panel with your Admin username. In the Users tab select the domain from the left pane (either @polarismail.net or the domain you added earlier) and then click the New User button. Fill in the details like username (for @polarismail.net we have to check for availability), a strong password, name and quota. All PolarisMail email accounts have a 25GB quota and as Admin you can choose any value between 1 and 25 for quota. Finish adding a new email account by clicking Add new user button. That’s it, you’re new e-mail account is up and running! Now that you have setup your e-mail account you can start using it with your favorite e-mail application or access it through the Webmail. Here is how you can synchronize your mailbox through multiple devices. Also note that IMAP is recommended rather than POP, as it’s a protocol made to support several devices accessing one same account, with all folders synced at our server, which also guarantees that our backups will be executed. 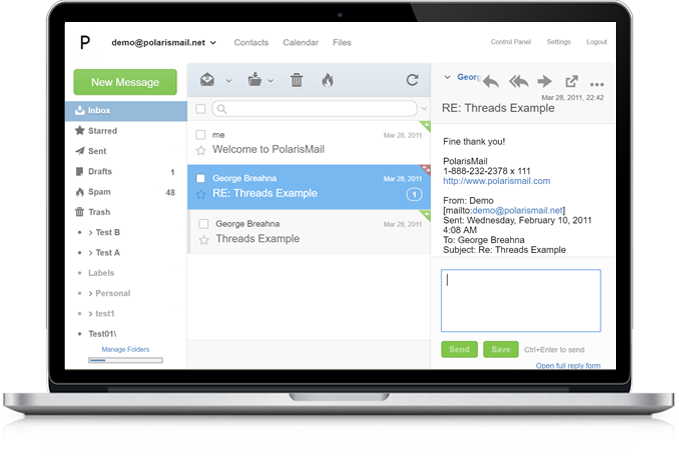 PolarisMail supports various webmails and you can test all of them before you choose your favorite. Supported webmails for Basic e-mail accounts are: AfterLogic, atMail, RoundCube and Horde. 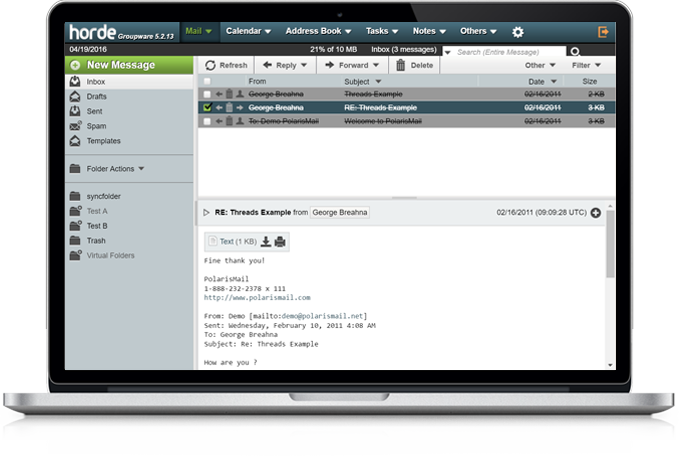 For Enhanced e-mail accounts you can use GroupOffice with extra features for collaboration or any of the Basic webmails. Webmails don’t need additional setup and you can access them from any computer or device, without installing other applications. 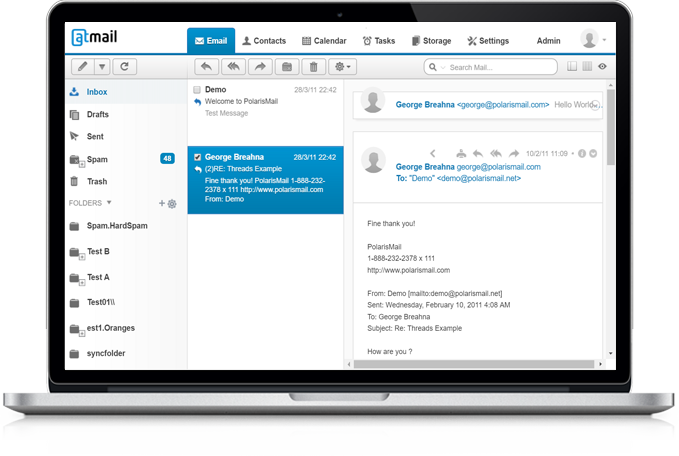 AfterLogic is a lightweight, fully featured webmail, compatible with any device. Use it for email, contacts and calendar. You can even access your PolarisMail personal drive directly, for saving attachments or sending documents. 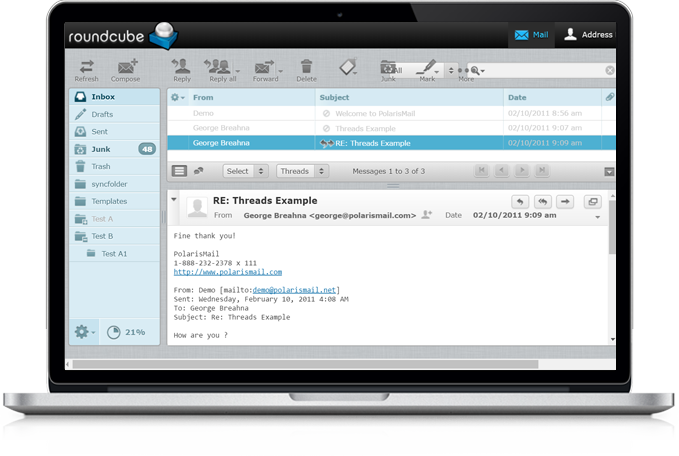 RoundCube is a lightweight and minimalist webmail, featured with email and contacts. atMail is a lightweight webmail, with clean design and fully featured. Use it for email, calendar, contacts and tasks. Horde is a fully featured webmail, with email, calendar, contacts, notes and tasks. 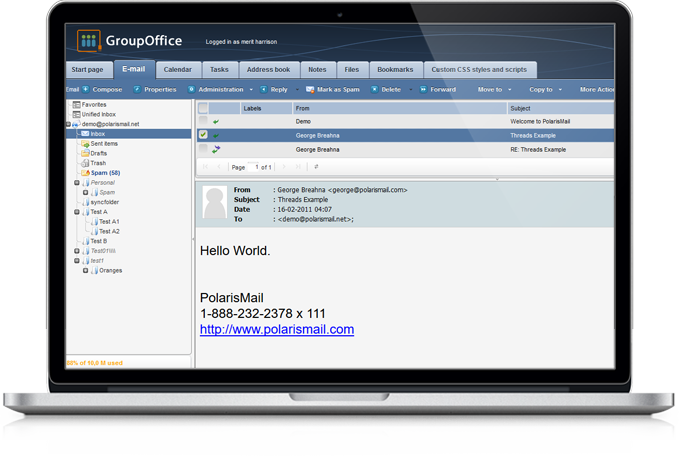 GroupOffice is the only webmail compatible with our Enhanced email services. It is fully featured with email, calendar, contacts, tasks, notes and collaboration tools like appointments, sharing calendars, files or folders. To setup your e-mail on Mozilla Thunderbird or Outlook, you will first need to setup autodiscover for your domain (refer to step 1). For exact steps follow these instructions for Thunderbird or these steps for Outlook. Make sure you use your full e-mail address when you add the account. You can use any e-mail app available on your device, including the native app. Remember that, if you have an Enhanced account, you can use ActiveSync, to not only sync e-mails, but also contacts and events. For iOS native e-mail app follow these steps and for Android follow this. Remember to always mark the option to “Require authentication” (sometimes referred to as “My server requires SMTP authentication”). Switching to a new e-mail provider can be intimidating. That’s why our Support Team is here to answer your questions. To setup your new mailbox you can browse our FAQs and Wiki guide or you can talk to our Support Team through chat or ticketing system. Also, our Support Team can help you move your previous mailbox, contacts and calendar to your new one.